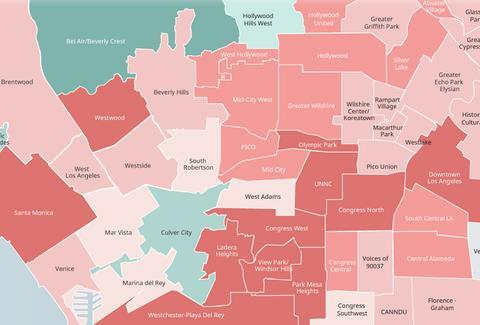 If you live and pay bills in LA, then there’s a good chance that you’ve got way less cash to spend on significantly more important things like delicious cheeseburgers and donuts, thanks to increasing rent prices in almost every damn neighborhood. 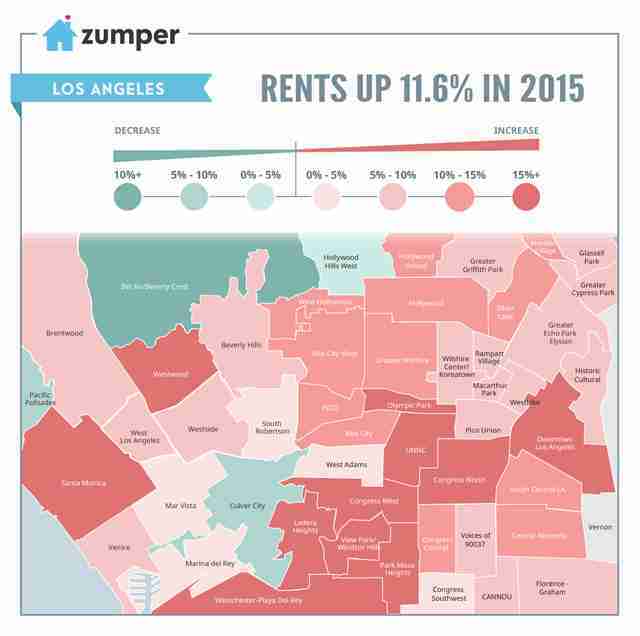 In fact, Angelenos are shelling out almost 12% more for rent in 2015 than they did last year, according to new end-of-the-year data from listings site Zumper. As illustrated in a map from the site (shown below), the median price for a 1-bedroom apartment went up in all but four neighborhoods this year, with the highest increases in areas like Santa Monica (up 17%), Downtown (up 15.7%), Westwood (up 15%), and unfortunately, several other neighborhoods saw rates go up at least 10%. Meanwhile, prices actually went down slightly in 'hoods like Hollywood Hills West (down 2.2% to $1,820), Culver City (down 5.2% to $1,930), Bel Air/Beverly Crest (down 11.5% to $2,300), and Pacific Palisades, which remained the 12th most expensive neighborhood in the city after dropping 7.2% to $2,320 a month, according to the Zumper report. Check out the map below, and, uh, start stashing some cash for 2016? Tony Merevick is Cities News Editor at Thrillist and will probably complain about rent prices for as long as lives. Send news tips to news@thrillist.com and follow him on Twitter @tonymerevick.